When you think of stone you think of a hard, powerful material, with strong lines and unbending willpower. 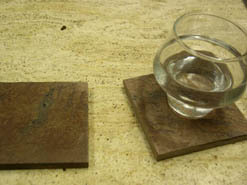 While the lines found in stone may be chaotic, random, or even sloping, there is still a certain strength, an inner certainty that comes from simple right angles and straight lines, such as those found in the square stone drink coasters below. Panther is a natural sandstone, that is noted for its rich textured surface, and its ability to easily absorb the moisture from a sweaty glass. 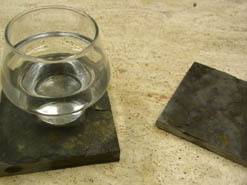 When cut into a square demeanor, the lines on the edge of the stone become the frame for the surface of the piece. 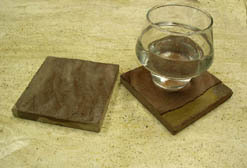 In this way, the shape of the coaster is, itself, a platform for enjoying the natural beauty of each piece in the entire set. Powerful echoes ring out from the distant past, calling to us, showing us visions of the way things were. A silent fossilized testimony to the beauty of life in all of its forms. 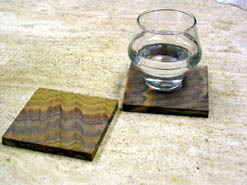 You can see by the pictures of our rainbow sandstone coasters, that this stone does not like to behave. Instead it explodes in a random array of colors, and patterns, which swerve in wavering lines across the surface of the stone. However, this chaos can be contained, and maintained, by cutting the stone piece down into a simple square, which acts as the boundary for unrequited chaotic yearnings. The deep red hues found within the surface of the ruby sandstone beverage coasters, all merge and flow within one another, creating an incredibly subtle mix. This array has hints of burgundy and crimson, all mingling like symphony, harmonious even in their disparate conditions. 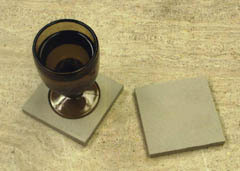 The simple gentle textured surface of the moondyne drink coasters, is complimented nicely by the straight square cut nature of these functionally absorbent drink coasters. The right angles, and straight lines, serve to direct the flow of color throughout the stone. A kaleidoscope of disparate colors, each chip a unique expression in a multi hued wonder of contrast and compliment, resulting in a mosaic design which is sure to elevate the elegance of your home in numerous ways, while also protecting your surfaces from harm. 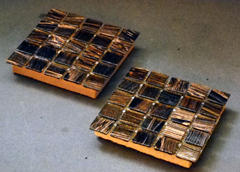 Brilliant shocks of gold and copper burst forth from the surface of these attractive coasters, giving them a shining demeanor which uplifts and elevates the ambiance of any setting. Coupled with the innovative canal style design, these functional pieces are a fashionable way to help keep your home looking amazing. A flash of light bursts forth from beneath the heavy blanket of the clouded sky, giving these coasters a powerful demeanor that seems to rumble with force, grumble with power, and tremble with the need to break free of the dark refrain that holds it in place. Set against set, twenty five separate chips, each with its own unique landscape, coming together to form a vision which is truly spectacular. Bright golden yellow hues are contrasted with snow white squares, which collude to form unique patterns of light and bright which give the surface of these attractive pieces a glowing amicable demeanor which extends in warmth outward to the surrounding atmosphere. 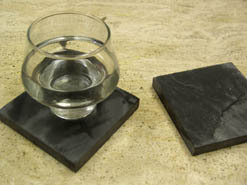 This is combined with a sandstone base to create a coaster set which is truly enchanting, and highly functional. 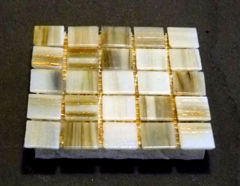 Bright golden streaks of sunrise burst in powerful lines across the surface of these coasters, the glass chips each containing a unique expression of the chaotic nature of the pieces formation. 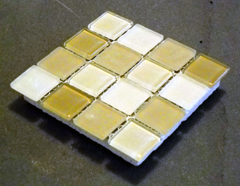 All of this is set atop a sandstone base which is designed to hold the moisture that drips down from a cup and past the tiny mosaic square chips. 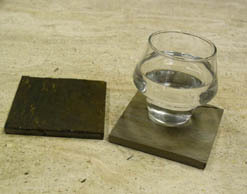 These coasters are made from pieces of polished copper, a quartzitic slate which is mined in the foothills of the Himalayan Mountains. When it is removed, the stone is initially rough, and heavily textured, with clefts and rises appearing all across the surface of the material. However, when it is honed down to a smooth finish, that dimensional quality disappears, replaced with the complex afterimages that are trapped within the flat surface of the coaster. 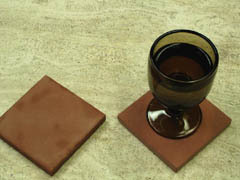 The earthen colored surface of the earth slate beverage coasters, is broken by lines of contrast and color, and occasionally is sundered by morning red glow hues, which penetrate the face of the stone. 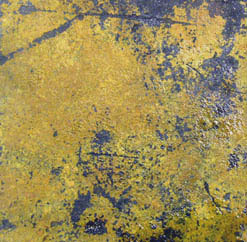 The result is a material that is rich with unique character and personality. As the gentle green brown surface of the stone lies quietly in wait, a golden dawn begins to emerge, a glow of yellows, oranges, and bursting sunlight hues, all tempering the earthen color of the material, giving it a shining beauty, and a glimmer of hope. 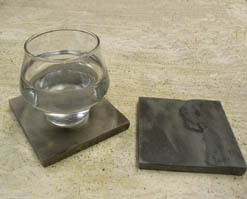 Combined with the gently textured surface of the stone, and cut into attractive straight line designs, these absorbent coasters are a wonderful centerpiece for any rustic or natural stone decor. Mountain black is a dark colored slate, but it is more than merely black in color. Instead it is a wonderful mix of black hues, every color of the night that you can imagine, all swirling and melding in a powerful mix, like a symphony of color with a tempestuous melody. 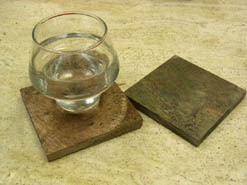 Multi African stone drink coasters are a wildly colored mix of powerful contrasting tones. The deep black midnight surface is broken, again and again, by lightning bright flashes of gold, yellow, red and orange, to create a chaotic and wild portrait right in the surface of every piece. 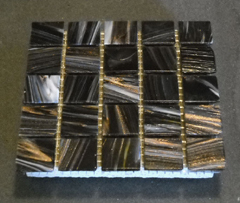 These colors, combined with the weight, dignity, and power of the stone itself, serve to create a coaster which will enrapture the attention of anyone who enters your home. When you deal with nature, there is always going to be chaos. Nature is not obedient or orderly, it doesn't sit down and take orders. Instead nature is alive, it is growing, evolving, it is a veritable symphony of change, which cannot be controlled only seduced. This principle is key in the understanding of the multicolored china natural stone, which is used in these lovely and vibrantly wild drink coasters. The red hues found in the surface of these square drink coasters are dark and foreboding, yet it is this silent and mysterious demeanor that gives them their dignity and style. Powerful and brooding, the personality of this material is unmistakable, and will add unique flavor to any setting where they are used.